or most people, no matter how bad a nightmare is, it always comes to an end. But for Cata and the others, there may be no escape. 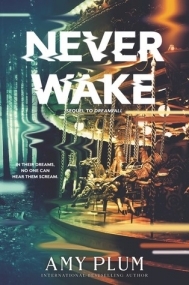 After an experimental treatment meant to cure their insomnia went horribly wrong, the teens were plunged into a shared dreamworld where their most terrifying fears became reality. The six of them have no way of waking up. And they’re now beginning to realize that if they die there, they might actually die in the real world. One of the dreamers is already gone, and anyone could be next. So they must work together to survive. But as they learn the truth about one another, they soon discover they are trapped with someone far more dangerous than their nightmares…. What worked: This is a satisfying conclusion to the Dreamfall series. In this second book, six teens are trapped in an experimental treatment to cure insomnia that has gone terribly bad. Seems that if you die in the dreamworld, you really die. Two of the teens have already died. The rest try to find a way out of the nightmare. They have found if they work together, they might be able to survive. There's a rumor that one of the teens is a psychopath. How far will that person go to keep that secret? This book is even better than the first book in the series! Each nightmare is from someone in the group. Only all of the teens not only witness that nightmare, but live through it. Let's just say I will never look at those dolls at the Disney It's A Small World exhibit in the same way again. Each teen holds a secret. In the experiment, they find they have some kind of psychic link. When they work together they are able to survive a deadly situation. And there are more than a few grisly nightmares these teens have to face! There's also a mystery on unsolved murders that someone in the group knows about. I didn't guess who until the very end! I also liked how each of the teens faces their fears at the end for a very satisfying climax. Nightmare on Elm Street meets Flatliners, this novel has just the right amount of horror that isn't over the top.